Deer hunting has its fair share of ups and downs. But there is one feeling that is worse than any other. There is a bottomless pit that hurts more than anything, twisting and turning within your stomach after shooting a buck (any deer for that matter), but not being able to recover him. 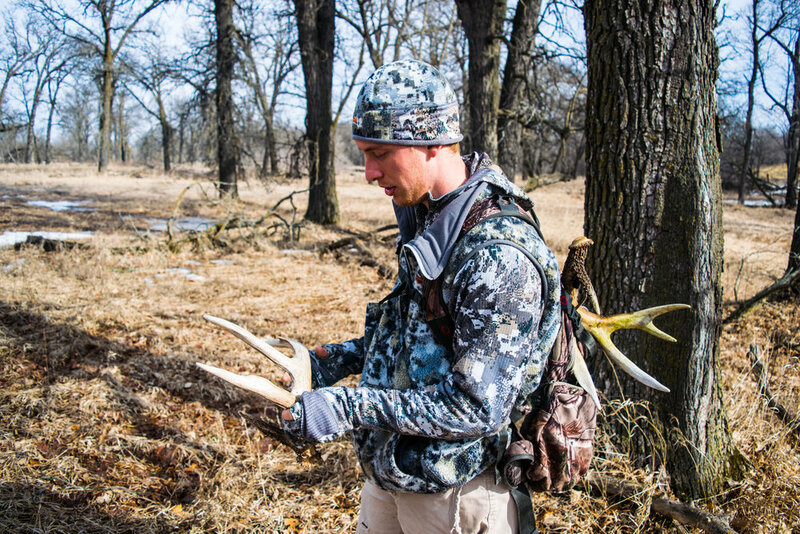 There can be countless questions running through your mind after a moment like this, but there is one that can keep you up at night more than any other..."Did the buck die? Will he make it?" I finally had that question answered for me this past weekend in regards to the buck I shot back in November, but wasn't able to recover. On November 17th, I shot a mature nine pointer, but never recovered the buck. (You can read about the story here.) I was hopeful that he would live through the shot, but there was always that little part of me that wondered... Was there anyway I missed something? Did I look enough? Was he lying somewhere dead? These questions in the back of my head, combined with the fact that he never showed back up on trail camera made me seriously wonder. I consistently pondered if the question would ever be answered for certain. Throughout the last month I have been shed hunting the area in and around where I shot the buck, hoping and praying that I wouldn't find him dead. With every antler that I found, I wanted the next one to be his. Saturday, it finally happened. While I was shed hunting with my friend Tyler, we had just met up and came to a pause. While standing and game planning for the rest of our walk, I turned to my right and I saw it. A great big tine poking up from the grass, and my eyes widened with disbelief! I walked up to the shed, and after I had the chance to have it in my hand, I knew who it belonged to. It was from the buck that I never recovered - he made it. Tyler and I had previously decided we would name the buck "Rage" if he survived, simply for the fact that the buck survived a rage broadhead. Now, I could finally breath a sigh of relief, for that I knew Rage was alive and well. I was beyond thrilled to find one of "Rage's" sheds. Finding Rage's sheds not only took a weight off of my shoulder, but it gave me another thing to look forward to for next season. Having history with a buck is one of the best parts of deer hunting, and now I will have the opportunity to create history with this buck. As one chapter comes to a close, the next one begins. The dominoes have fallen into place, and the game begins one again. You can bet on one thing. I'm going to do everything that I can to get another chance at "Rage", and next time, I'm hoping the outcome will be much more favorable.